AIDA’s Art Guide will take you off the beaten track and directly into the studios, workshops, and galleries of Israel’s decorative artists. Please be sure to contact the artists by phone or email before you visit, to make sure their location has not changed. Begin your search below by selecting the Medium and/or Region of your choice from the pulldown menus. Then print, email or text your search results to your phone before your travels. You can also purchase a printed pocket-size color version of the guide from Amazon.com. Or view a full-color PDF version of the guide on your desktop computer, laptop, iPad, tablet or smartphone by clicking the download button below. Please be sure to contact the artists by phone or email before you visit, to make sure their location has not changed. 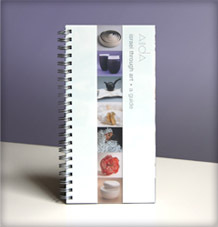 AIDA thanks the Karma Foundation for supporting the Art Guide's online directory.